Adam Gussow and Alan Gross, a.k.a. 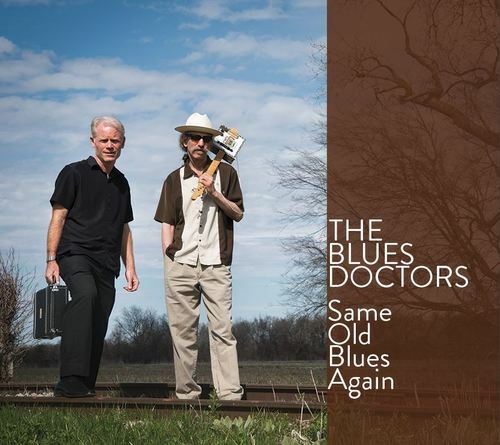 The Blues Doctors, are Mississippi-based blues veterans who play a mix of Delta standards and urban grooves from the Texas-to-Chicago axis with some New Orleans funk thrown in. Theyre a two-man band with a big, bold sound: Gussow on harmonica and drumset, Gross on guitar, with both men sharing vocals. Their debut, Roosters Happy Hour (2013), spent several months at #1 on Amazons Hot New Releases in Acoustic Blues chart and hit #10 on the Living Blues national radio airplay chart. Same Old Blues Again is their second album. Recorded at the Hill Country Recording Service in Water Valley, Mississippi, it swings, struts, and grooves hard, beginning with a bluesed-up remake of Tequila that features Gussows squealing high notes. Rollin and Tumblin introduces a new sound for the duo: cigar-box guitar, handmade by Gross, with slide and harp paired Delta-style. The title track, driven by a loping New Orleans beat, sings of a young man betrayed by love, drinking heavily and drifting downward towards despair. Classic compositions by Mississippi masters Elmore James (Cry For Me, Baby) and Arthur Big Boy Crudup (Thats All Right) anchor the album, which ends with a three-track live set recorded at the North Mississippi Hill Country Picnic and powered by Jimmy Reed (You Dont Have to Go), Muddy Waters (Take You Downtown), and Robert Johnson (Crossroads Blues). The bittersweet sounds of soul-jazz show up in Mercy, Mercy, Mercy and Gussows minor-key original, Blues For Hank, both of which feature jazz bassist Bill Harrison, a Chicago veteran. The big surprise on Same Old Blues Again is Magic, Olivia Newton Johns 1980 pop hit, arranged as a quiet but urgent blues-pop incantation. Memphis-based R&B vocalist Zaire Love shadows and dances around Gussows voice and harmonica, creating a haunting sonic tapestry, casting a spell. NOTE: This album comes as a zip file containing 11 mp3s (256 kb/s) plus a PDF version of the liner notes. Please remove the PDF file before transferring the mp3s to iTunes or other music player. Blues Doctors - Same Old Blues Again (mp3s) same old blues again;modern blues harmonica;blues doctors;adam gussow 281377863 8.99 asgussow Fresh Download Available!